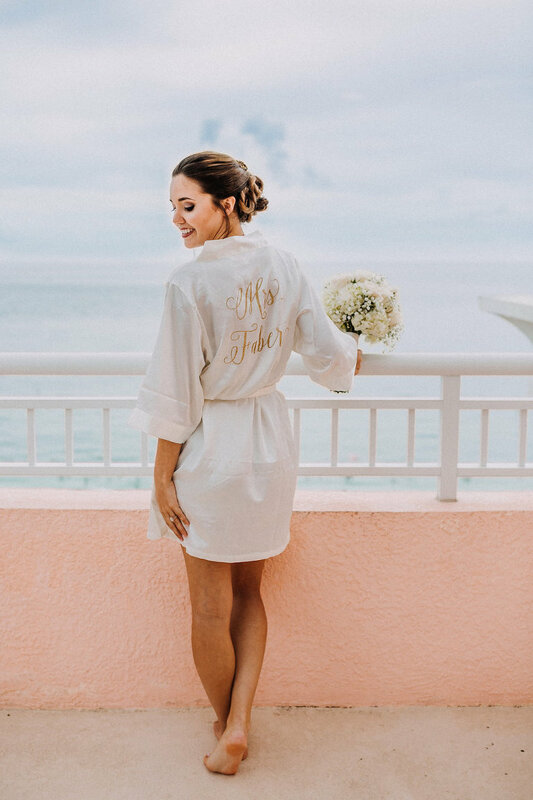 Chelsey and Donald’s classic Clearwater Beach wedding featured a timeless navy, gold, and white color palette that complemented their beautiful Gulf of Mexico venue backdrop. The Fort Myers, Florida couple searched for a resort-inspired Clearwater Beach wedding venue that could be a one-stop shop for their wedding weekend. The bride and groom wanted a trusted Clearwater Beach wedding photographer who made them feel comfortable, and that made them feel like they were longtime friends. Having made the decision to extend their wedding into the wee hours of the night, Chelsey and Donald wanted to ensure that their reception was not only a place for celebration, but that it also looked beautiful with custom draping and lighting. Gabro Event Services provided music, a stunning reception backdrop for the sweetheart table and monogrammed GOBO light featuring the couples name and wedding date. Looking back, the bride shared that her most memorable moment from their wedding day was the couple’s first and last dances. We wanted our wedding venue to be a one-stop shop. It was very important to us that our venue was a resort, like hotel. The Hyatt Regency Clearwater Beach was just that for us. Their staff was phenomenal, their hotel is beautiful and the ballroom was the perfect size. We did not want a ballroom that was too large or overstated. Roseli and Lindsay’s team are top notch; They answered all my questions, and helped me through the entire process. We were there for almost a week and they made us feel like family. We ultimately fell in love with the Sky Terrace. it gave us a beautiful view of the ocean, with a nice breeze, and was the perfect place for our ceremony. The entire experience was exactly what we were looking for. My husband and I are so thankful that we picked the Hyatt Regency Clearwater Beach for our wedding venue. We wanted someone who made us feel comfortable, that we could trust and that were like our friends. We met Brittany and Leo of Rad Red Creative at my matron-of-honor’s wedding, and immediately we knew we wanted them for ours. Their photography skills are the best in the business. We trust Brittany and Leo very much, and they services the provided were top notch. What did you look for in a wedding DJ/rental company? We wanted a rental company that was a one-stop shop. It was very important to us to only have to deal with one rental vendor and that was exactly what Gabro Event Services offered us. Kabe and his team set everything up and created our vision. He was great to work with and has everything you could ever need to create the perfect reception space. We are so thrilled to have worked with him. 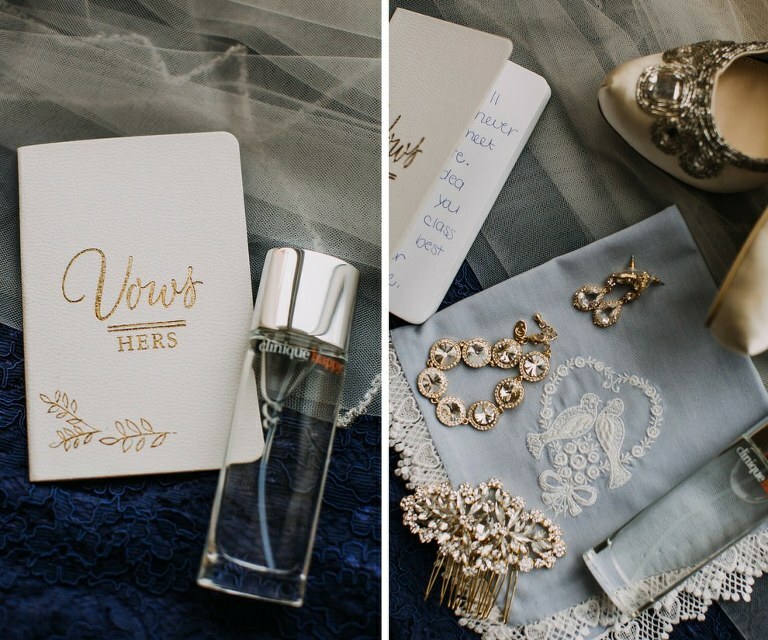 How would you describe your wedding design inspiration? Clean and classic. We wanted a very streamlined and simple wedding, where the small personal touches could stand out. Navy, gold, and white. We wanted classic, timeless colors that we could look back at in twenty years and still love. We would recommend that they enjoy the process. We enjoyed every step of the process, and our big day was the best day of our lives. We took our time planning, made it personal to us and did what we wanted. 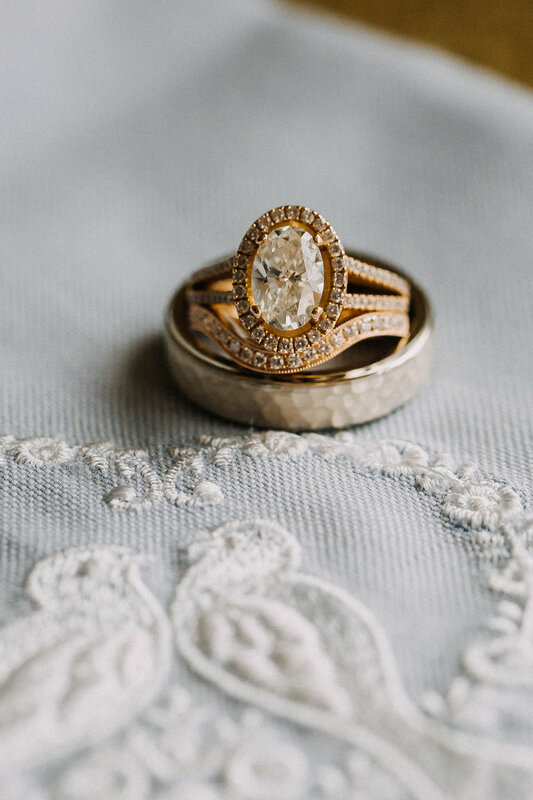 We really wanted to plan a wedding that was true to who we were as a couple, and because we did that we can honestly say that we have zero regrets or things that we would do differently.